I had to read some monstrous reads during March, so I decided to pick up this novel by Kiersten White. I was curious to see whether I’d like it or not.. Especially since my experience with her Paranormalcy-trilogy wasn’t.. all that great, to be fair. 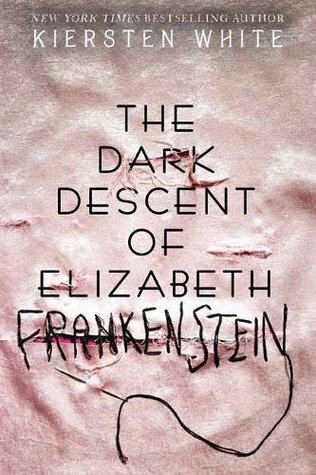 So, let’s see how I felt about The Dark Descent of Elizabeth Frankenstein! Does it have to be said? Yes. I absolutely loved the writing in this book – especially compared to Kiersten White’s Paranormalcy-trilogy, which I mentioned in my intro. I remember having quite some issues with those books and feared The Dark Descent of Elizabeth Frankenstein would be the last book of White I’d ever attempt but luckily.. That’s not the case! This book read like a train, was dark in a way I expected and dreaded at the same time and.. surprisingly, pulled me in. Why surprisingly? Because I honestly couldn’t make up my mind about the book during the first hundred pages. You’re thrown into the story and start with way more questions than I usually like. You know Elizabeth is looking for Victor, you know Henry sent her a letter months earlier which she’s angry about and you know Justine is traveling with her, believing they’ll be meeting up with both Henry and Victor. That’s it. You don’t know what happened, what was in Henry’s letter and why Henry definitely won’t be at their destination. I have to say I didn’t really like all the questions at first, mostly because I simply didn’t know where the story was headed because of it. I felt like I was reading for the sake of reading. Once that stopped, I really enjoyed the story though! When it comes to the characters.. They all have issues? And not the small kind either. But it did make for a pretty interesting cast – although it definitely had its disadvantages as well.. Note that I mean actual mental issues and not in the sense of them being problematic characters or anything. I sought to puncture Heaven and instead discovered Hell. One thing that stuck with me while reading is how.. very focused Elizabeth is throughout the story. Her sole purpose seems to be Victor and his health, his studies, his anything. Although the reason why makes somewhat sense, I also felt it caused her character to feel somewhat flat. Even more so since she often gave the impression of using everybody else in her life. As for the ending.. I thought it very weird, didn’t like it. Why? I truly believe the ending doesn’t make any sense whatsoever. Nor does it fit with everything that happened, or with the thoughts our main character had. It simply.. doesn’t fit. Geez.. One one hand, I’m so happy this book was tons better than the Paranormalcy-trilogy but on the other hand.. It did have some elements I had issues with.. So now the question remains.. Would I or would I not use one of my rare “free buys” to get my hands on a copy of Slayer? Time will tell! Have you read anything by Kiersten White? What did you think? Anyone read Slayer and can tell me whether or not it’s worth getting a copy? What’s the last horror / horror-ish read you picked up? Did you like it?